98 points, Robert Parker's Wine Advocate, December 2011. 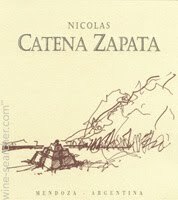 The 2008 Nicolas Catena Zapata is a blend of 60% Cabernet Sauvignon, 30% Malbec, and the balance Petit Verdot and Cabernet Franc that spent 24 months in 100% new French oak followed by 24 months in bottle prior to release. It delivers an inviting bouquet of wood smoke, pencil lead, espresso, incense, lavender, black currant, and black cherry. This sets the stage for a full-bodied, powerful yet elegant, beautifully proportioned effort with great depth and volume.